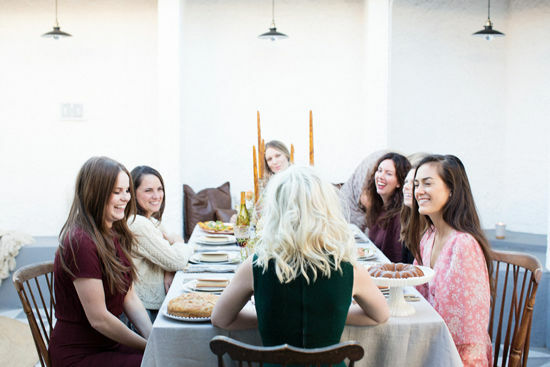 D E S I G N L O V E F E S T » FRIENDSGIVING! gosh, this year has brought so much change and i’m feeling so incredibly grateful for everyone and everything in my life. i wanted to celebrate thanksgiving with some of my closest friends before we all head our separate ways for the holidays. i’m also really excited to have a space to entertain in my new home, so figured it was the perfect way to get me into unpacking mode and invite some friends over for the first time. 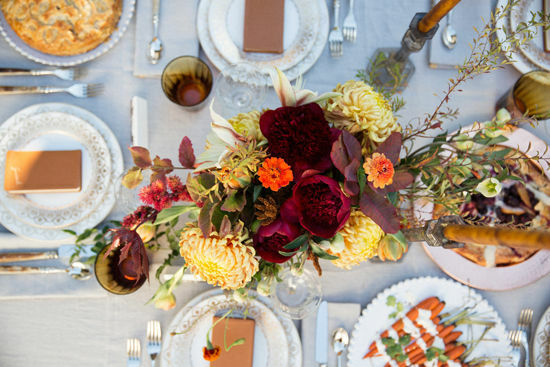 the inspiration for the evening was dutch masters meets 70’s california thanksgiving – a bit funky, but with lush, classical florals and traditional elements. 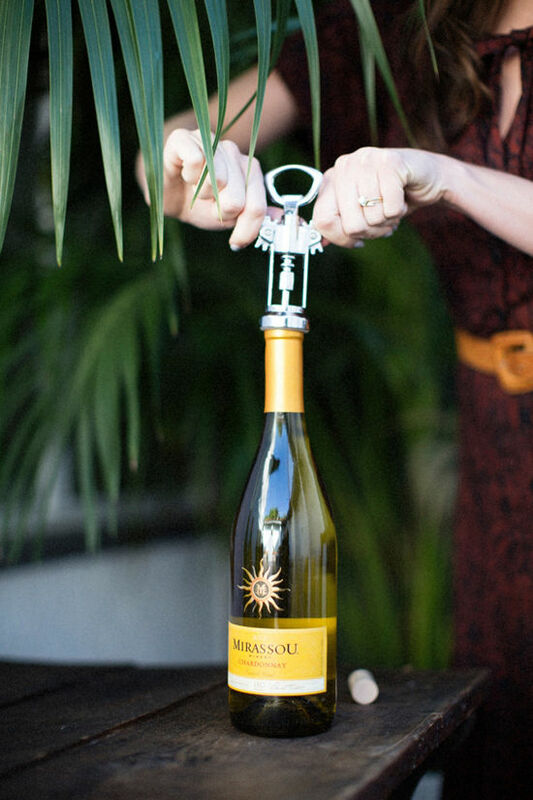 we often work with Mirassou Winery and i was so happy that they supported the vision of this party and helped make it come to life. it ended up being such a lovely evening celebrating with some of the best people i know. we’re also hosting a giveaway with Mirassou below where you can win some entertaining essentials for the holiday season! we served both the Mirassou Pinot Noir and the Mirassou Chardonnay. the pinot paired perfectly with the turkey pie that the kitchy kitchen made and the chardonnay was great with the grilled carrots (which were out of this world!). 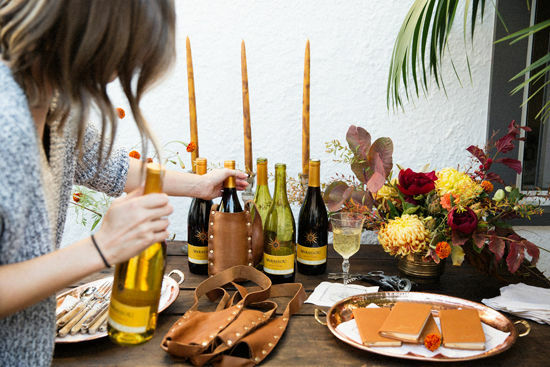 bash, please also created a leather wine holder for all of the guests at the dinner to take home with them, along with a bottle of Mirassou wine. i think sometimes the idea of cooking a large thanksgiving meal can seem overwhelming, roasting a whole turkey and preparing so many side dishes. 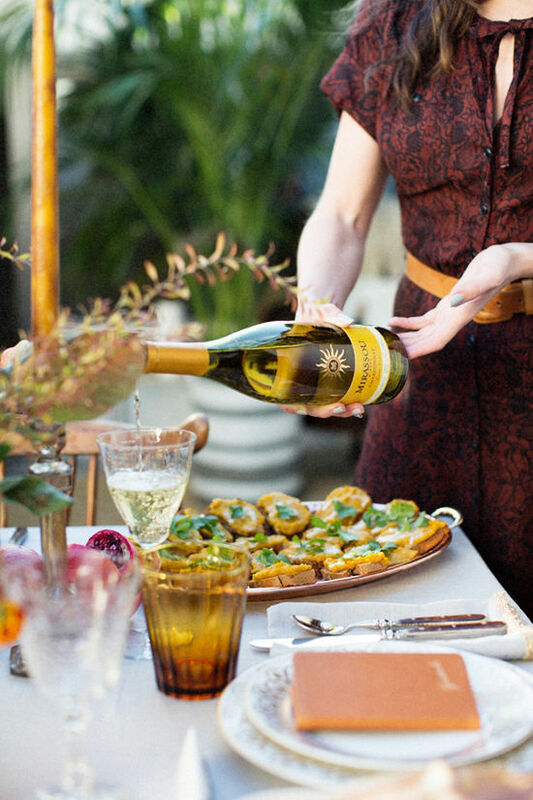 we kept the menu more simple for this occasion, serving four dishes and two fruit forward versatile wines that made food pairings easy. it really was perfect, less time in the kitchen and more time socializing. bash please gave everyone a gratitude journal at their place where they sat and we passed out pens and all of the guests wrote a little note about each person in the group and why they are grateful for them. it was a really sweet thing to read after everyone went home after the party. a few more friends joined us later in the evening, and we spent many hours listening to music, talking, and eating second rounds of dessert. i want to get a fire pit for the winter out here! it was really important to me to set the tone in the new house as a place that’s welcoming and full of life and love. this night definitely did that, and now i can’t wait to plan more little patio parties. 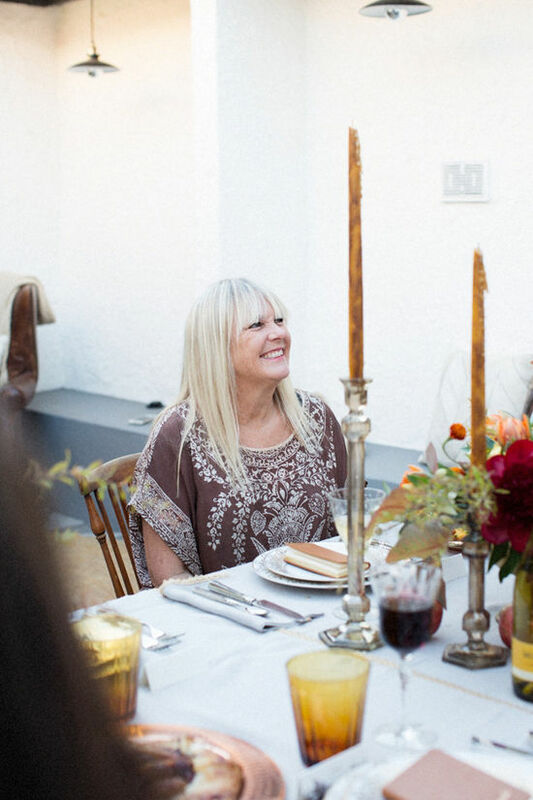 and a big thank you to everyone involved in creating such a beautiful dinner and celebration in my new home! bash please for their amazing design and coordination skills, the kitchy kitchen and sweet laurel bakery for their delicious dinner and sweet treats, found rentals for the perfect furniture, gorgeous florals by the bosky dell, and all of the tableware (including those killer candle sticks) by the ark. 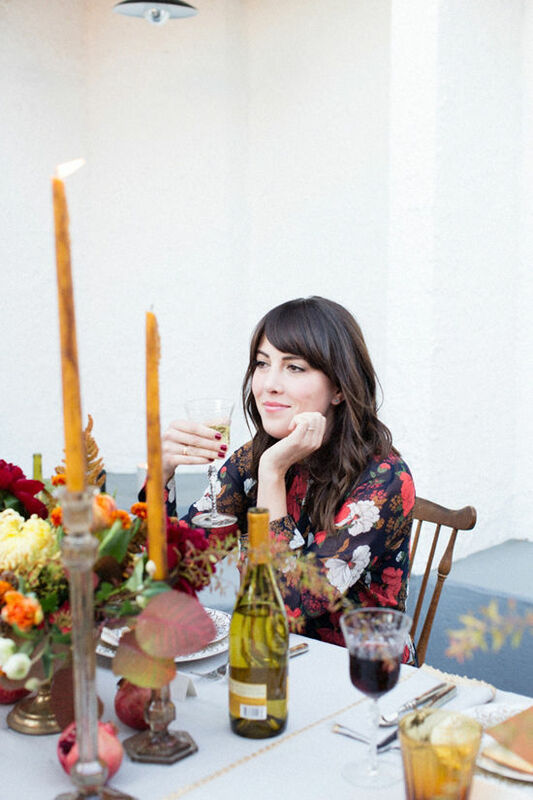 all of the pretty photos are shot by jesse chamberlin. 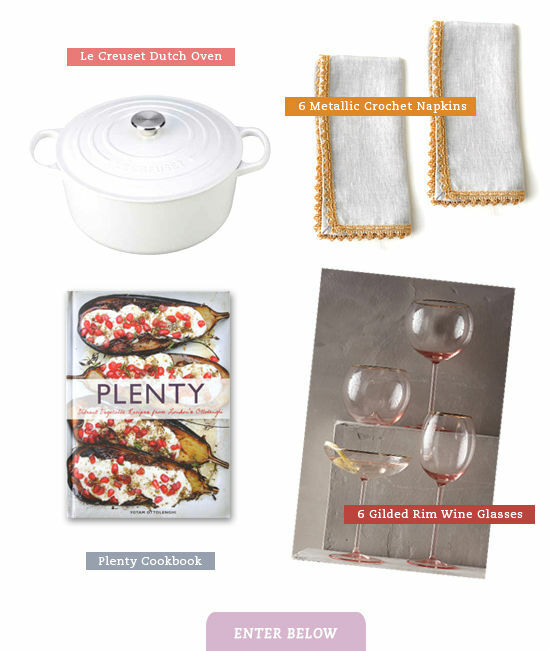 one winner will receive the wine glasses, cookbook, napkins and le creuset 5/12 QT in white. the winner will be chosen on monday november 23rd. open to US only and 21 + years old. *by leaving a comment on this post you agree to the giveaway terms and conditions, to read the full rules click here. I love to make roasted carrots with chickpeas in a harissa-garlic marinade. 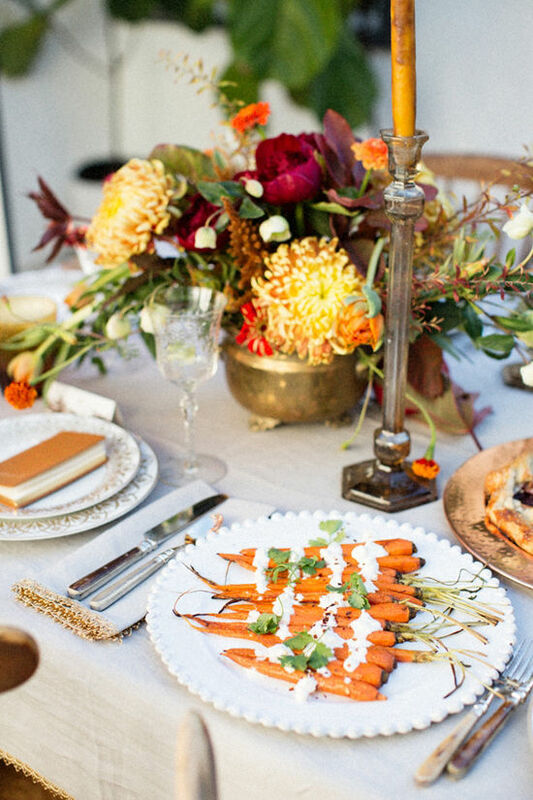 It looks and tastes like fall, but is a little different than the typical Thanksgiving-fare. That said, my favorite thing to eat is stuffing – remind me why we only eat it once a year?! thanks for the giveaway. Your new place looks beautiful! It’s all about the pumpkin pie for me! I love your Friendsgiving! 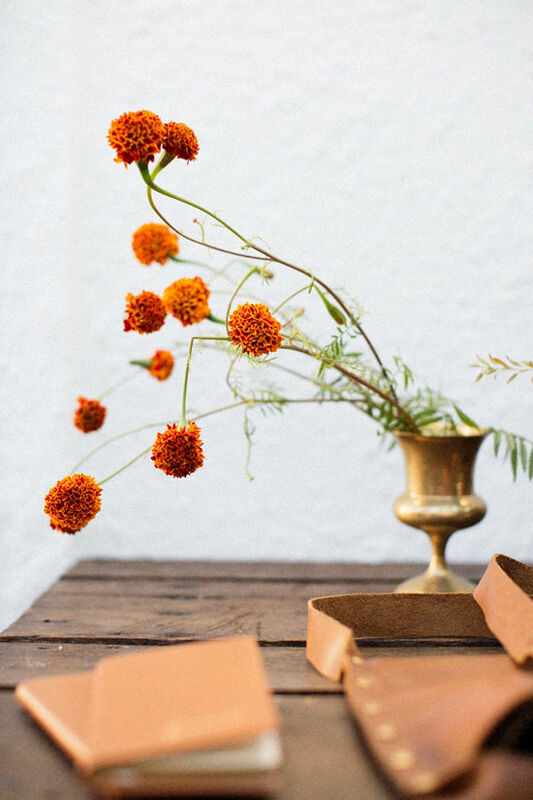 Beautifully executed and such a lovely idea! My favorite holiday side dish is my mom’s homemade macaroni and cheese. It may seem odd, but it’s the one dish my sister and I fight over each Thanksgiving and Christmas. The recipe came from my great aunt, who made it every holiday. I love that’s not only yummy, but a family tradition. My brother makes a sweet potato casserole that’s to die for. My favorite is always the stuffing, the way my mom makes it! Thanksgiving food is my favorite! I especially love roasted root veggies, homemade cranberry sauce (although I’m a fan of the canned kind, too!) and pecan or pumpkin pie with fresh whipped cream. YUM. The year I hosted Thanksgiving for the very first time, I made Giada’s Pancetta-wrapped Pork Roast. It was way less stressful than turkey and folks still talk about how much they loved it! And dang, those roasted carrots with chick peas sound so good, alexis. I love to make my aunt’s apple pie in a cast iron skillet recipe! It is so simple (only 5 ingredients! ), and is always a big hit. The Thanksgiving side that I always pile onto my plate is the casserole! Whether it’s made of green beans, broccoli, or sweet potatoes; you name it, I love it! I love, love sour cream mashed potatoes! the ina garten recipe is amazing. 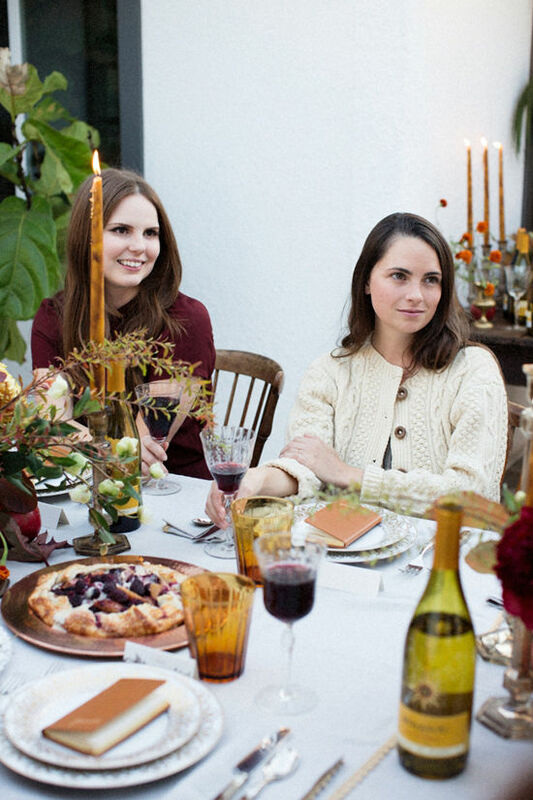 Oh, man this tablescape is gorgeous and it’s killing me because I’m not hosting Thanksgiving this year! The last few years in a row, I’ve made the Class Sage Stuffing recipe from Apartment Therapy and it’s so good, that my family now insist that I make the stuffing forever, from here on out! As simple as it sounds, my favorite recipe is for Cranberry Orange Sauce. Even though my husband is die-hard cranberry-from-a-can, the rest of my family loves it! Honestly, I’m a big fan of green bean casserole. I don’t know why, but I can’t get enough! As I’m getting more into my own Thanksgiving celebrations, though, I really love looking up new twists on traditional foods, and vegan versions for those I know with allergies. In other news, where did you get that fabulous green dress? I’m obsessed with stuffing! It’s something I would not touch when I was younger, and I deeply regret all those years of not having it in my life. My favorite Thanksgiving recipe is for “twisted biscuits.” These are buttery biscuits filled with chopped pecans, cinnamon, and sugar. They are folded over and cut into strips, then twisted to give them a braided look. DELICIOUS. My brother and I have been helping my mother make them since we were 3 and 5, and now (at age 25) I make them on my own, and of course still help Mom for Thanksgiving dinner! I always make sausage balls for Thanksgiving breakfast. For some reason, this has become my favorite thing to make, and it’s a wonderful way to start the day while watching the parade. My favorite Thanksgiving dish is baked brie. I usually get Mt. Tam (an organic brie style cheese by California based cheesemakers of Cowgirl Creamery), cut it in half and bake it for about 10 minutes. It is served with grapes, nuts and honey it’s always a hit! My mom’s crispy stuffing with celery, onion, and rosemary is my favorite dish every Thanksgiving! Always baked on a cookie sheet and never put in the turkey. That would just be wrong! My favorite Thanksgiving dish is always the stuffing! We make it simply — from the store box (I know, we’re awful! ), thinly sliced carrots, and rounds of chorizo. Half gets stuffed in the turkey, and half is left “dry” to enjoy with gravy. My favorite is roasted brussel sprouts. Not fancy, but so delicious! I’ll never forget my 14th thanksgiving. My mom was sick and about 10 am my dad told me I would be making the meal! I made my aunt Kay’s dinner rolls first and placated every panic attack with the idea that if it all went wrong we would just eat those rolls with mom’s homemade jam followed by the pies we had made the day before. It was a mess but I figured it out somehow and I was pretty proud of myself when my family of 8 (we are 11 now) sat down to that meal. the dinner rolls are definitely my favorite! although I’m more likely to make fresh loaves of bread lately. fingers crossed! I love those napkins and need a crueset! My favorite thanksgiving side dish is stuffing BY FAR. This year I’m going to try my hand at cornbread stuffing with leeks and mushrooms. What a gorgeous Friendsgiving, and your new house is beautiful! I am working on a Friendsgiving fundraiser for the nonprofit No Kid Hungry, and will definitely be taking inspiration from your party. I especially love the color scheme and all the different textures. My favorite Thanksgiving recipe is apple pie. I started using lemon zest in the pie crust and will never go back! My recent (past 3 years) favorite is pan-fried brussels sprouts with mustard maple dressing and toasted pecans. SO GOOD; even all the self-proclaimed brussels haters gobble them up! It’s all about the stuffing. It is the one day of year that it is served. 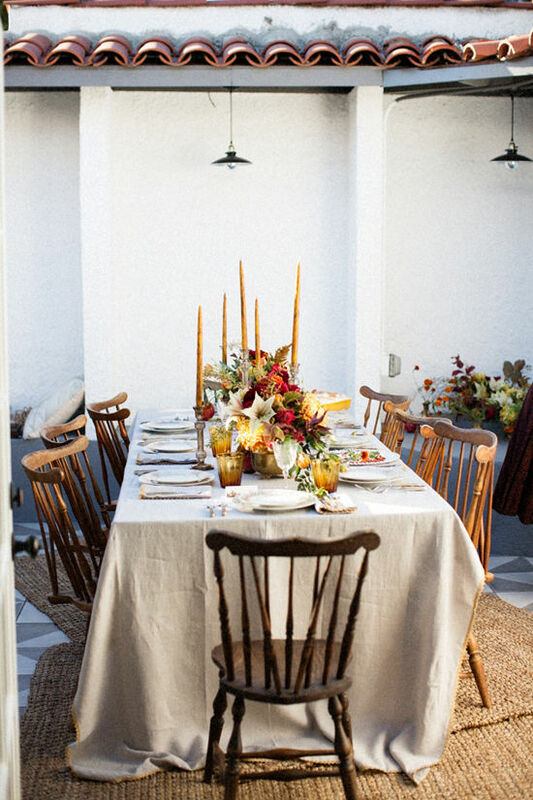 I love everything that goes with a Thanksgiving Feast! But most of all, I love my aunt’s recipe for dressing. Its just the right blend of gooey and crispy. Her secret? Bell’s Seasoning! My favorite recipe to make are my “drunken cranberries”- made with the orange liquor, Cointreau. Mashed potatoes and gravy. Mmmmm. And apple pie (a la mode, of course). My favorite Thanksgiving recipe is definitely stuffing! I love it so much, I almost forget about the turkey! Brussels sprouts sautéed with bacon and a splash of apple cider vinegar. So simple but so delicious. Individual Cornish Game Hens for our intimate meal. Slip plenty of butter under the skin and season the heck out of it before baking. They were easy, delicious, and looked so cute sitting on our individual plates. I’ve been obsessed with Ina Garten’s haricots verts with herb butter (http://www.foodnetwork.com/recipes/ina-garten/haricots-verts-with-herb-butter-recipe.html) and make it for Thanksgiving at my in-laws’ every year now. So much fresher than green bean casserole! Happy Thanksgiving! I love the warmth in these images and the food looks simple and delicious. I would love to serve my guests wine out of a wine glass and not mugs anymore, so my fingers are crossed. My favorite side dish to make is the simple, tried and true herb roasted red potatoes! Last year my sister made a brussels sprout slaw (she found the recipe on Cookie & Kate) and it was SO GOOD. I think I ended up eating more of that slaw than anything else on the table….I ate so much I felt sick! I’m going to try to make it this year…and hope my anti-sprouts boyfriend won’t complain. My favorites are brussel sprout salad (with bacon of course) and gotta have a great mashed potato side! chestnut stuffing, a treat every year. My favorite side dish to bring to Thanksgiving would have to be oven-roasted brussel sprouts. Cover them with evoo, salt, pepper, lemon juice and lemon zest. Place on a cookie sheet and bake for 12-14 minutes at 400 degrees. Super easy and a great crowd-pleaser! Being a vegetarian, my Thanksgiving is less about the Turkey and more about the Veggies! Roasted potato salad with brussels sprouts, hard boiled eggs and asparagus with a mustard vinaigrette is my favorite! PIE ALL THE WAY. I love to make pumpkin pie with a ginger snap crust – so delicious. My favorite dish is scalloped potatoes! The cheesier, the better. It may not be very traditional but my favorite thanksgiving side is mac and cheese! Mini pumpkin pies in a muffin tin! They’re perfect for those who just want a taste of dessert and can be personalized with fun crust cutouts for each guest. Shaved brussel sprout salad with dried cherries and chia candied walnuts!!! 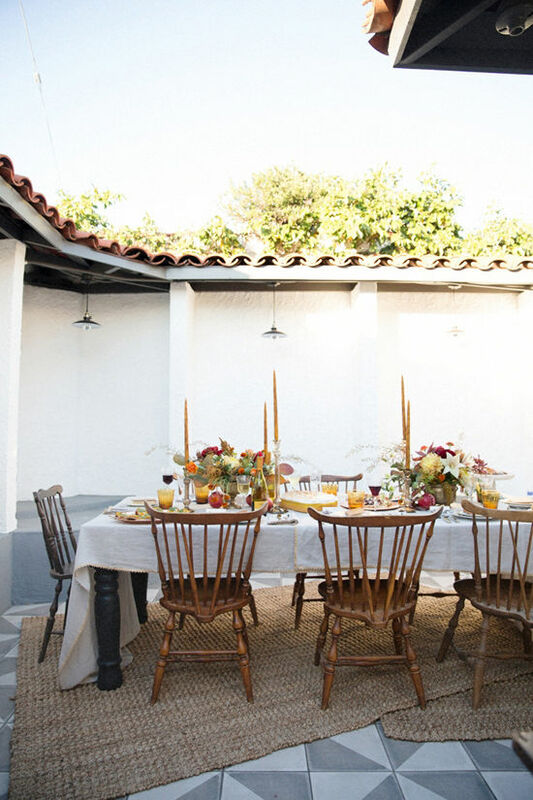 Such a dreamy patio! Beautiful evening. It’s all about the sides for me. Panko crusted pancetta mac and cheese. It is such a hit every year and so amazing. But I have to say, the year we roasted our turkey with thick bacon was pretty epic too. My grandmother’s cornbread dressing. It’s so simple and always the favorite dish at Thanksgiving. Thanks! This year I’m obsessed with sweet potato pie. I’m always in charge of pie- everyone’s favorite is four and twenty blackbirds salted Carmel apple that I’ve made the last two years. While the ingredients sound a bit out there, especially the bitters and black pepper.. It yields the perfect pie! Garlic mashed potatoes and gravy are a warm comforting side dish that I have always enjoyed. I love to make apple pie with a pretty lattice top and plenty of homemade whipped cream! My favorite thanksgiving dish is corn bread stuffing. My favorite thing to make for thanksgiving is stuffing with sausage and thyme. So so delicious! I would also love to win, one bin of kitchen items was lost/stolen in my last move. It had my coveted le creuset in it and I was absolutely devastated! Roasted carrots, parsnips, and chickpeas with a pomegranate molasses. Sweet and spicy! Also, sounds difficult, but super easy to make! My favorite thanksgiving side dish is twice baked swet potatoes with toasted marshmallows. My girlfriend made these for our Friendsgiving and it came out DELICIOUS. So soft and sweet! I love making fresh cranberry jalapeño salsa! I need that Dutch oven. We eat about a hundred different casseroles in my family! Broccoli casserole is where it’s at. My favorite Thanksgiving dish is definitely the green beans or stuffing (duh!). This year I found a green bean recipe with bacon and walnuts so for sure going to try that one out! Happy Thanksgiving! I would say my favorite part of family Thanksgiving is watching my parents cook our traditional meal- my Dad mashing the potatoes and meticulously making his gravy while my Mom focuses on her famous nutrolls and ice box cookie desserts. For Friendsgiving it was the first time many of us had cooked these dishes, and I have to say they came out delicious! Great mashed potatoes and the turkey was almost all gone by the time we were done! I make my Nonie’s famous garlic green beans every year. Fresh green beans, a hellava lot of chopped garlic, fine olive oil, and patience. That’s it, MANGIA! My favorite side dish would have to be Giada’s ciabatta and chestnut stuffing! Carbs, all the carbs. I love everything about Friendsgiving! And Thanksgiving! I have to admit a good gravy is what makes the whole meal just that much better. I have a couple family recipes that I absolutely love but my favorite is probably the ULTIMATE decadent roasted garlic mashed potatoes. Mixed in with the potatoes is cream cheese, butter, and sour cream along with the oodles of garlic. YUM! Green bean casserole, green bean casserole and green bean casserole!!! My grandmothers stuffing and dads secret pecan pie recipe! To die for. The stuffing! I love it! I try a new version every year. My favorite recipe is my grandmas stuffing and ambrosia salad!! I make a pumpkin pie every year! Last year I made a gluten free vegan all natural version (including the whipped cream) and everyone raved. My mom’s roasted onions and parsnips! I’m lucky to live in a place where year-round grilling is possible, as well as growing fresh herbs…love the south! My family always does a grilled veggie (broccoli, asparagus, peppers…anything!). But this is the recipe I’m trying this year. Now that parents are older and kids have become grownups too, we all share the cooking responsibilities for Thanksgiving. Last year I made a cinnamon bread pudding with whiskey caramel sauce that has been requested again this year! I love sharing the cooking responsibilities…more time for everyone to enjoy the company! I love me some sweet potatoes! I do Balsalmic vinegar roasted carrots as a side dish and a goat cheese cream drizzle before they are served, they are delicious! it’s a toss up between stuffing and mac + cheese. Mashed potatoes with heavy whipping cream – so bad, but SO good. Thank you! Smitten kitchen has a to die for recipe on sweet potato medallions that has been my go to for years. All the thanksgiving tastes in one bite. it’s a must for this time of the year! Love brussels sprouts as a side. Either roasted or in a warm salad. Roasted brussel sprouts baked until the small leaves get very crispy. Season with large garlic cloves, red pepper flakes, EVOO, and a heavy sprinkle of salt. OHHHHH…my favorite thanksgiving side dish has to be sweet potatoes with marshmallows on the top, almost didn’t try it when I 1st had it, it is not a traditional English side dish, but my American brother in later convinced me and I’ve loved it ever since!! i make a mean vegan green bean casserole that even the harshest of vegan critics beg for! Paula Deen’s Pumpkin gooey cake! A slightly healthier version. Yum! I love to make a sweet potato dish, but savory instead of sweet. I slicethe sweet potatoes into discs and roast themwith garlic, thyme, olive oil, salt, pepper and red pepper flakes. They carmelize on the bottoms nicely and make a lovely addition to the table. I’ve always thought that I should then make a mash out of them, but the go so quickly I’ve never tried it. i love pumpkin pie! also i love trying out different turkey and gravy recipes each year! Stuffing three ways: sage, cornbread, and sausage. Stuffing is probably the best food in the world – why not have three different kinds?! It’s a tie between stuffing and pie! My favorite Thanksgiving recipe is my grandma’s cornbread and sausage stuffing! I love my mom’s wild rice stuffing with cranberries! It’s delicious! My favorite side dish is sweet potato casserole with brown sugar and toasted marshmallows on top! Hard to choose only one! My mom’s stuffing and cranberry sauce. I love to make my Roasted mole turkey the blend of spices and chiles give the whole house a pleasant aroma. I always help my mother out with all of her dishes, but my specialty is a whole berry cranberry sauce with spices and orange zest that I’ve been perfecting since I was 10. So good and the perfect complement to the other rich dishes. My favorite Thanksgiving recipe would have to be our stuffing. It’s made with slightly sweet cornbread and has a delicious mix of veggies and spices! The only Thanksgiving recipe I CAN make is pumpkin cheesecake, thankfully everyone I know loves it! I love to make pumpkin bread in a coffee tin. Little ones can decorate it like a turkey, too! Butternut Squash Soup – when I go home to Louisiana, shrimp find their way in. . .Thanks! The giblet gravy is always the star of the show during Thanksgiving! I’ve gotta say I love me some green bean casserole! We always have a vegan and regular option (along with everything else down to the tofurkey) because I have lots of vegan cousins. YUM to it ALL! My gran’s green bean casserole! I cannot wait until next week! Bri! Your new pad looks so amazing! 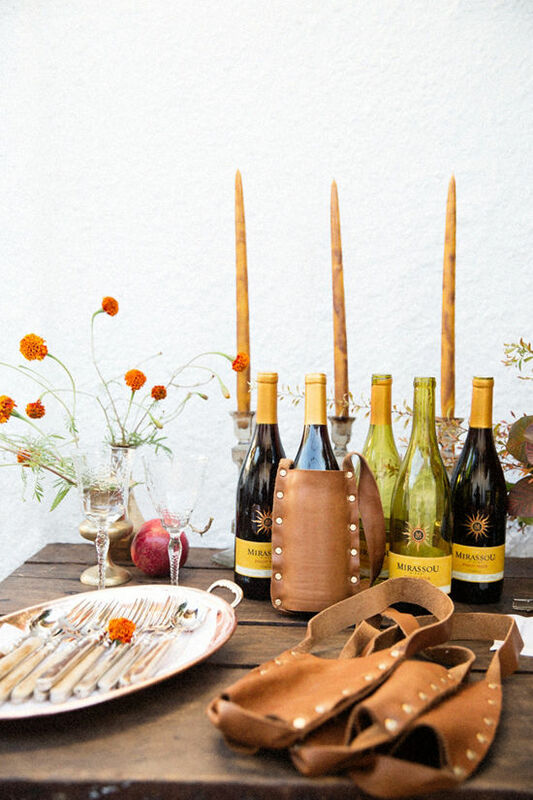 I love the tablescape and how the Mirassou wine bottles compliment the overall color palate. I have been gushing hard over that white matte Le Creusat dutch oven! Meow! Combine bread, parsley, onion, salt, sage,thyme, and rosemary. Add broth and butter; toss lightly to mix. Use to stuff a 12-pound turkey or bake covered, in a 2-quart casserole or dutch oven at 325º until heated through, about one hour. Loving your new home, Bri! What a lovely way to introduce your friends to your new home and celebrate together. I found my favorite Thanksgiving recipe last year. It’s Alice Medrich’s pumpkin pudding (a.k.a. no-pie pumpkin pie). It’s basically crustless pumpkin pie. Which is great since I usually just like to eat only the pumpkin pie filling anyway! Thanks for the giveaway! My favorite side dish is a horrifyingly bad for you but amazing tasting broccoli rice casserole. I worked for a Spanish tapas restaurant for many years that had amazing food and every Thanksgiving they would close the restaurant. We’d bring all of our families in to sit at a large community table. And instead of potatoes we would tortilla espanola, which was super tasty with the regular fixing. Plus I always find Thanksgiving to be fun when you can mix family, friends, and misfits. Nothing better than a table, good people, good conversation, and wine! My favorite side dish to make is more of an appetizer. Its whipped ricotta with lemon, pepper, and olive oil all warmed up in the oven for about 20 mins. I put out big pieces of baguette out to dip with. Its so scrumptious! I make this apple, sausage, and parsnip stuffing with sage from Bon Appetit (http://www.bonappetit.com/recipe/apple-sausage-and-parsnip-stuffing-with-fresh-sage) and it’s my favorite thing! I like that the fresh herbs and the apples & parsnips lighten up what can easily become a heavy side. It’s SO good. I highly recommend it! My new favorite side is a roasted Brussels sprouts dish with cranberries and mushrooms. A new tradition in our home!!! My favorite side is the green bean casserole. It’s not a fancy recipe, but a savory comfort food that reminds me of family and the holiday season. My favorite Thanksgiving dish is my Mom’s very unthanksgiving spinach dip — so much sour cream and watercress and picking frozen spinach out of your teeth for the rest of the night! My favorite Thanksgiving side dish is stuffing! 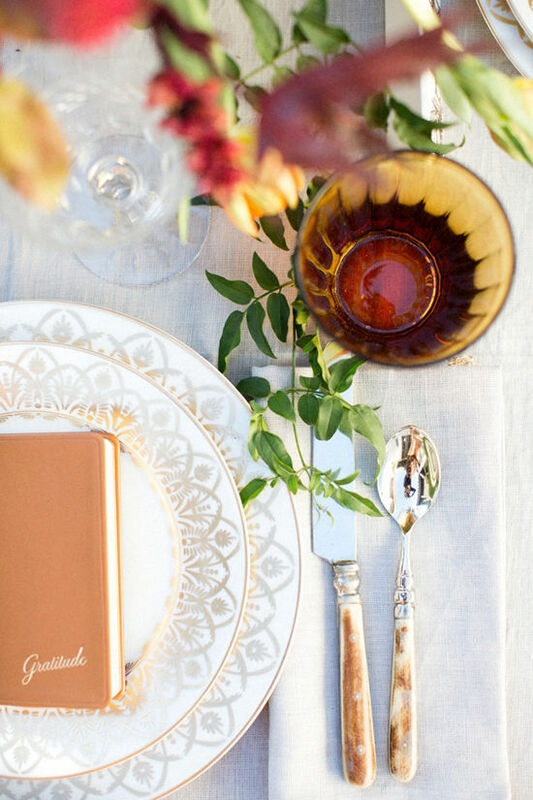 My favorite Thanksgiving recipe…champagne punch. It’s not food, but this stuff will make EVERYONE grateful for you. Simmer the cranberry juice, orange, cinnamon and rosemary in a large pot on low heat for 1 hour. Add sugar and stir until dissolved. Continue to simmer for an additional 30 minutes. Remove from heat and allow to cool completely. Transfer the concentrate to a beverage dispenser, or distribute between 2 large pitchers. Add orange juice and champagne. Stir well, and refrigerate until chilled. Garnish with a couple whole cranberries, or a rosemary sprig. Enjoy! We’ve started deep-frying our turkey yearly and it totally takes it to the next level! The first year was a little scary (from all the horror stories! ), but now we’re pros. What a beautiful table set up. My favorite Thanksgiving recipe is acorn squash with quinoa and feta. mmmm my family has been making turkey with sausage, apple, and prune stuffing and madeira cream sauce from a 1980 copy of gourmet magazine for as long as i can remember…. nothing says thanksgiving to me more than that recipe! yum. White CHILI! Super untraditional but oh my goodness, it’s always everyones favorite! Bake 3 boneless chicken breast halves in olive oil. Cut into small pieces. I love mashed potatoes for Thanksgiving. My mom has a delicious recipe that includes sour cream, cream cheese, redskin potatoes, salt, pepper, and garlic. YUM! My favorite side dish is the super simple mashed potatoes and gravy! I love the fluffy potatoes mixed with savory gravy! Sweet potato casserole. For sure. I love my dad’s turkey, mom’s rolls, and these mini pecan pie cookie things! The recipe is over 100 years old, and the ingredients are simple. We do everything by hand, and they’re pretty fool proof! Butter, egg, pecans, brown sugar, flower. Happy Thanksgiving! My favorite dish is my Grandma’s German sweet potato salad…so good. Beautiful pictures! My favorite thanksgiving side dish is green bean casserole. My favorite Thanksgiving side dish is my mom’s sweet potato puff! It’s this delicious blend of whipped sweet potatoes (not the ones labeled as yams in the grocery store, the pale kind), milk, and butter, topped with chopped walnuts, coconut flakes, and brown sugar then baked. I sometimes request it for special occasion meals as well and I’ve enjoyed making it for friends during Friendsgiving! This is probably the best giveaway! 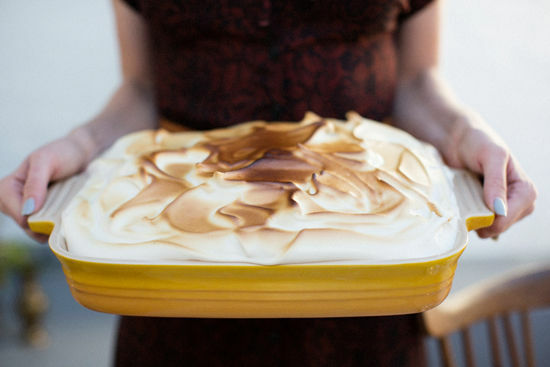 My favorite holiday recipe is the Meta given’s pumpkin pie from Food52~! It’s amazing!! My favorite thanksgiving side dish recipe is my friend’s mashed potatoes recipe. She makes homemade mashed potatoes and mixes it with caramelized onions. I look forward to it every year! Awesome giveaway. I love stuffing and cranberry sauce at Thanksgiving! My favorite Thanksgiving recipe is by far my mom’s stuffing. It’s made outside the bird, and it has bread cubes, sausage, celery, mushrooms, and herbs. It’s simple, but one taste of that, and I’m in Thanksgiving heaven! Stuffing with homemade cranberry sauce is my favorite part of a thanksgiving dinner! 2. Combine all of the ingredients for pie filling in a large mixing bowl. Beat until mixture is smooth and blended. 3. Set the unbaked pie crust on a baking sheet. Pour filling mixture into crust. 4. Bake in oven for 45-50 minutes. 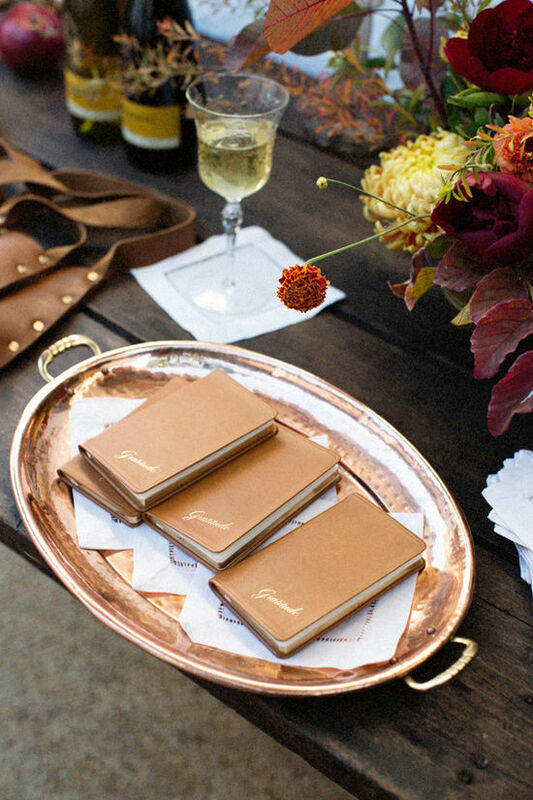 Beautiful party, I love the inspiration themes! My favorite side dish is a healthier take on the midwestern fave green bean casserole, which I grew up on — instead, I make steamed green beans and then lightly saute them in butter, dijon mustard, thyme, and sprinkle sliced almonds on at the end. On Thanksgiving we always make cioppino, an Italian seafood stew. Not traditional but certainly delicious! This friendsgiving, I will be bringing a persimmon shrub! This year, I’m making a recent favorite…pimento mac n’ cheese! I love the classic mashed potatoes with an extra heaping of gravy! Such a gorgeous, inspiring post! My favorite Thanksgiving recipe is pumpkin pie with homemade whipped cream, though whole-berry cranberry sauce is a close second. This year we’ll be eating cranberry sauce made from wild cranberries we picked ourselves on Cape Cod! I love to make broccoli rice casserole for the holidays. It’s a recipe that has lots of bad stuff in it (processed cheese, condensed soup) and barely any broccoli, but the taste instantly brings me back to my childhood memories of Thanksgiving. My most favorite thanksgiving dessert is a pumpkin cream pie, specifically the Pioneer Woman recipe. Delish! My favorite Thanksgiving dish is Peanut butter pie. The recipe was given to me by my aunt 10 years ago, and it became a tradition for me to make two. One for the dinner, and one for our family’s late night dessert hang outs! All of the desserts at Thanksgiving are amazing (pumpkin pie, berry crisp with vanilla ice cream, chai whipped cream and lattes) but my favorite savory dish usually ends up being the mashed potatoes with garlic and butter! yum. p.s. your home is lovely…it looks like such a beautiful gathering. cold me old fashioned but i love me some mashed potatoes and gravy yum! I will be bringing a loaded cauliflower casserole. Yes, the one featured all over facebook and pinterest. But it really is Super Delicious. I like to switch it up, but our family always requests a cauliflower and fennel gratin with plenty of smoky gruyere and crunchy breadcrumbs ! its the simple sweet potatoes with marshmallows on top. I love making pumpkin pie for thanksgiving. We’ve used the same recipe forever in my family, and it’s always on the table- no matter what the meal may be! My absolute favorite is roasted root vegetables, especially parsnips, drizzled with a little honey and cumin before roasting… So delicious! 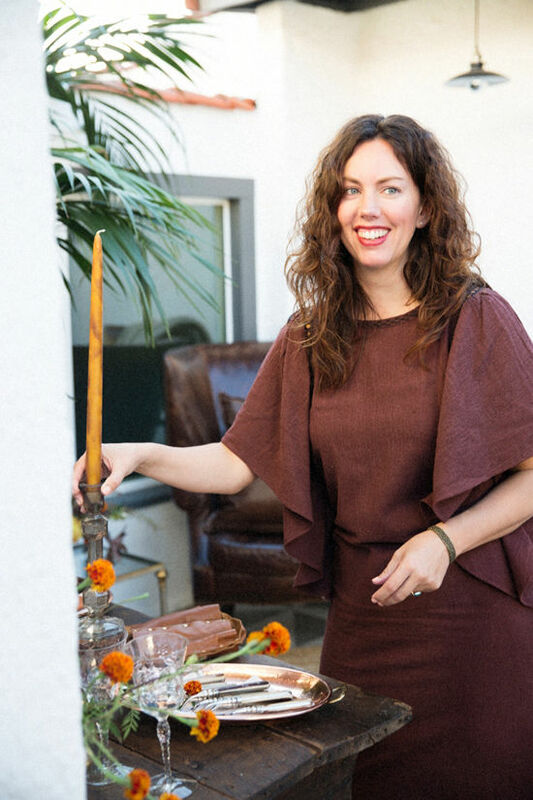 With newer food allergies my style has become a lot plainer without creams and cheeses, but with more variety of spices and cooking to bring out the real flavors. One fall favorite is roasted sweet potato drizzled in olive oil and kosher salt with a dust of chili powder for zing! My butterscotch bourbon pie has made people weak in the knees. Aligot (Super Cheesey Mashed Potatoes). You basically make mashed potatoes (use a ricer to crush them) then add a ton of tomme cheese, a little garlic, and cream. It’s like heaven. My favorite is the pie at the end and the leftover turkey sandwiches the next day! So looking forward to it! My favorite Thanksgiving side is cranberry crisp! 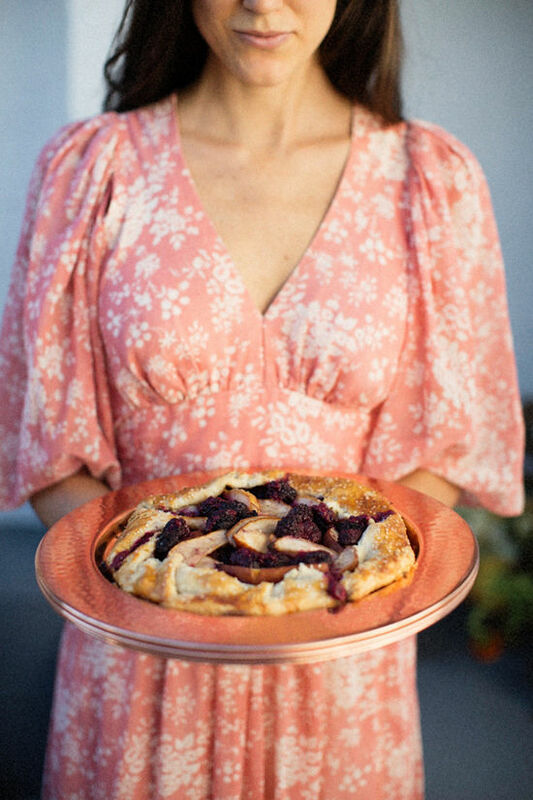 I use Danielle Walker’s Against All Grain recipe for blueberry pear crisp but use apples and cranberries instead. It tastes great with turkey and stuffing! My favorite recipe is SAUSAGE STUFFING…but the key is Bell’s Stuffing and sage sausage…YUM!! I love to make roasted vegetables as a side! Potatoes, corn, squash, lots I pepper and lots of oil. Mmmmm! Such an amazing giveaway! I go straight for the gravy. Could eat it with a spoon! Creamy, cheesy, rich scalloped potatoes!!! HELLO! I am making brussel sprouts gratin for Thanksgiving next week. I was asked to bring a “roasted veggie side” and we are all big brussel sprout fans so why the H not?! I can’t wait to drool and dance in the kitchen while doing it. XOXO This was a beautiful post BTW! My favorite side dishes are the traditional Campbell’s green bean casserole and yams with marshmallows and pineapple chunks. I use Thanksgiving as my splurge day to eat whatever I want no matter how unhealthy it is. Hello, I am Greek living in Greece so I cannoy enter the competition but I wanted to say that Mirassou is the Greek word for Share. I found it very appropriate for this dinner and will try to see if the wine is available here. My mom has always made mashed potatoes with toasted almonds and breadcrumbs. My absolute favorite, now I make it for my family! My favorite Thanksgiving dishes are actually the ones made from leftover turkey. Turkey sandwiches, turkey soup, salads with shredded turkey, and so on. If those doesn’t count as they’re not actually eaten on Thanksgiving day, then picnic potatoes are probably my favorite side dish. 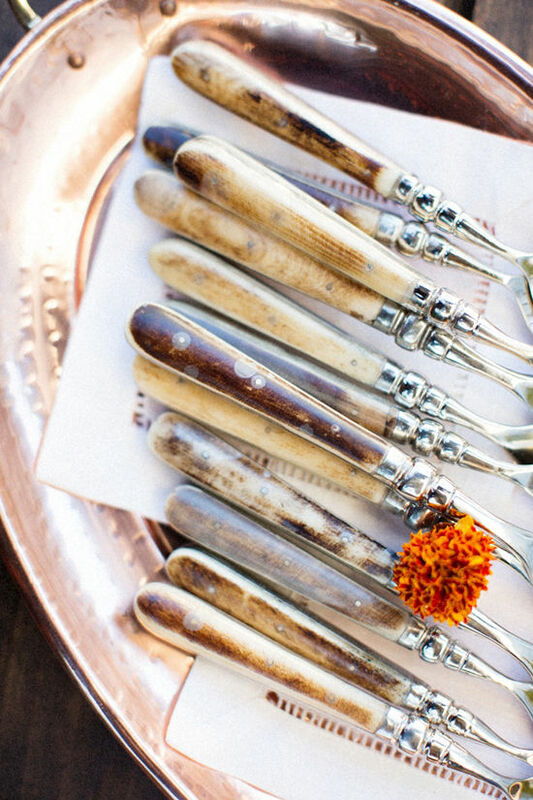 What an unexpectedly gorgeous theme for the celebration! My favorite Thanksgiving recipe is always and forever stuffing. I like to switch it up but lately I’ve been loving a version with cornbread and dried cranberries. That feast (and everyone in attendance) looks smashing! I <3 Thanksgiving. Cranberry sauce might be my favorite part of the holiday. Is that weird? I love to try a new variation every year. Dried cherries! Red wine vinegar! Ginger! Happy holidays! I love all the thanksgiving side dishes! Stuffing and pumpkin pie are my favorites. 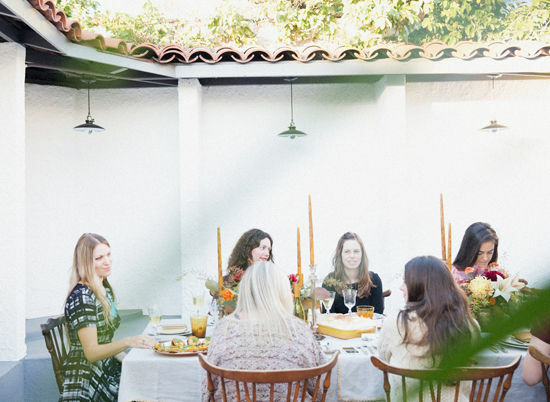 Your friendsgiving looks amazing! Thanksgiving is all about the sides! I love the turkey but it’s the potatoes, brussel sprouts, cranberry sauce, etc that makes the meal so festive. I love making chocolate caramel salted pecan pie. 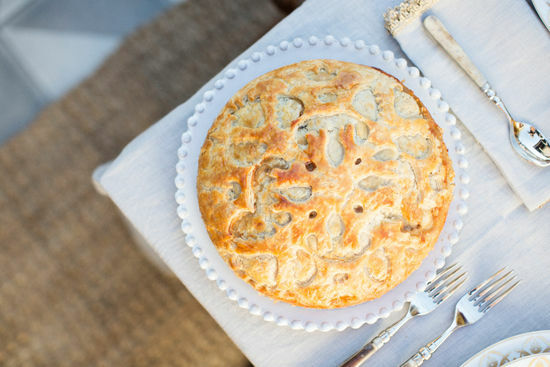 It’s a recipe I got from Southern Living and it is hands down my all time favorite pie to eat for Thanksgiving. I always love the green bean casserole ! Thanksgiving is my favorite holiday! My favorite side dish is shaved brussel sprouts with balsamic reduction. So freaking amazing. My mom’s green bean casserole has always been my holiday favorite. But this year I decided to try something new (part of my challenge to become a better cook). I made roasted brussel sprouts w/ a Parmesan cream (cream, rosemary, chives, garlic). I got the recipe from Southern Living’s recent edition, and it made the house smell so lovely! Being so far from family, that aroma made my day! My fav side dish is sweet potato casserole. The more marshmallows the better! i made these sweet potatoes last year and they were a total hit. beautiful AND delicious (and super fun to cut all of those tiny sweet potato rounds)! Crescent rolls from an old Southern Living recipe. Mmmmm. A hearty and colorful cheese board with cured meats and veggies of vibrant color! I love to make roasted brussels sprouts with walnuts as a side dish! My favorite thanksgiving dish is mashed sweet potatoes! So good and so easy 🙂 YUM! My absolute favorite thanksgiving dish is spoonbread! It’s like a corn souffle that I make in the crockpot. It’s always a huge hit!!! We were even more excited to discover the wonderful taste — sweet and caramelized, or salty and umami — of brussel sprouts. So, our favorite recipe is any kind of roasted brussel sprouts (with bacon, reduced balsamic, parmesan etc.). I always make a vegetarian stuffing with all sorts of veggies and pine nuts – sooooo good!! Love the idea of the gratitude booklets. I heard that the most grateful people are the ones that are the most happy! My favorite is Alton Brown’s brined turkey recipe! Stuffing with crusty San Francisco style sourdough bread and sausage….mmmmm…. But, really, it’s all about the leftovers! My favorite Thanksgiving side dish has always been baked corn. Corn, egg, sugar, and a few other ingredients make this sweet and savory dish. Pairs perfectly with turkey and stuffing! My mouth is watering already! Yum! Nothing says Thanksgiving to me like whipping up my grandma’s pound cake. So moist, so wholesome! Stuffing! It’s a once of year thing that is just so comforting. My mom makes the best! Firstly, congratulations on your new home, a thanksgiving celebration was the perfect way to welcome your loved ones to your home. My favorite side changes from year to year, but creamed corn is always in my top 3 that rotate. So easy to make and delicious! My family does a different take on Thanksgiving dinner. Now that we are all older, my sisters and I all seem to have a million places to be on Thanksgiving Day. 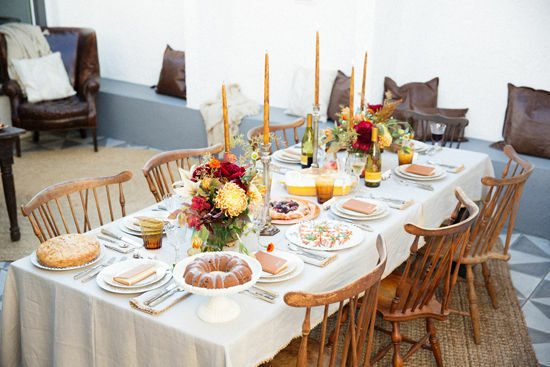 A few years ago, we decided to change the way we did Thanksgiving dinner and turn it into a Thanksgiving Breakfast Feast. We all head to my parent’s house on Wednesday night–arriving at varying times–and we spend some time playing games and eating some light snacks. On Thanksgiving, we wake up early in the morning and prepare a huge breakfast feast-complete with ham, french toast, pancakes, donuts, and fruit. We even squeeze in a pumpkin pie (it’s a fruit right!?). I really love the way my mom makes french toast–she always seems to add the right amount of cinnamon and vanilla. So classic and soooo yummy! My favorite thanksgiving dish is my moms homemade wheat rolls brushed with butter! Yum! My favorite thanksgiving side dish is definitely mashed potatoes! Stuffing just makes it even better! The turkey. Crazy right? But years ago Martha posted of a roasted garlic/herb butter turkey and it’s been a favorite since! In the book ‘A Modern Way to Eat’ there is this incredibly delicious root vegetable bake with parsnips, chanterelles, carrots, etc. It tastes so comforting and is a nice healthy alternative to a mound of stuffing! It would not be Thanksgiving dinner in our house with out the side dish of Gourmet Sweet Potatoes. The brown sugar, pecan topping is something that we all fight over. Stuffing!!! I absolutely LOVE stuffing! Especially made from scratch. My beautiful aunt Susan makes it best. Can’t wait for Thursday 😀 Happy Thanksgiving!!! 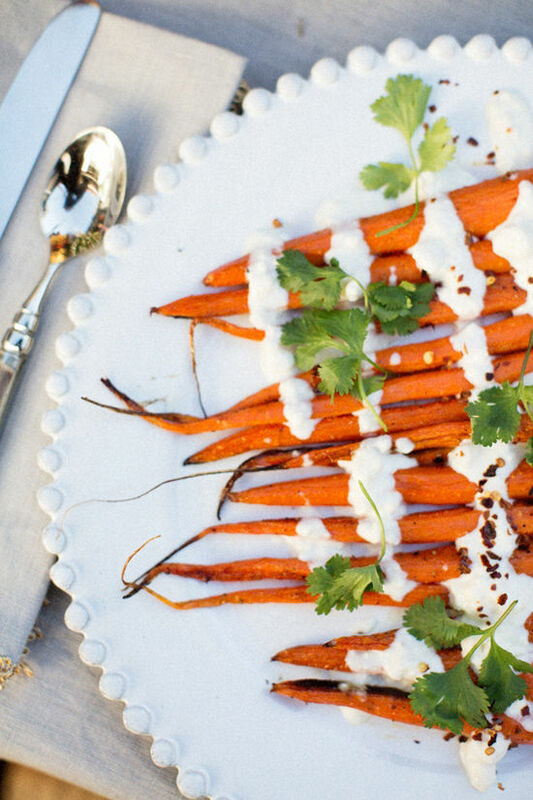 Carrots cooked with maple syrup added to the water–even kids love them! Sweet potato casserole with pecan topping! My MILs pecan pie, they are the best I have ever tasted. I make a mean butternut squash gratin, each year the recipe changes a bit (hello, wine) but no one seems to care. 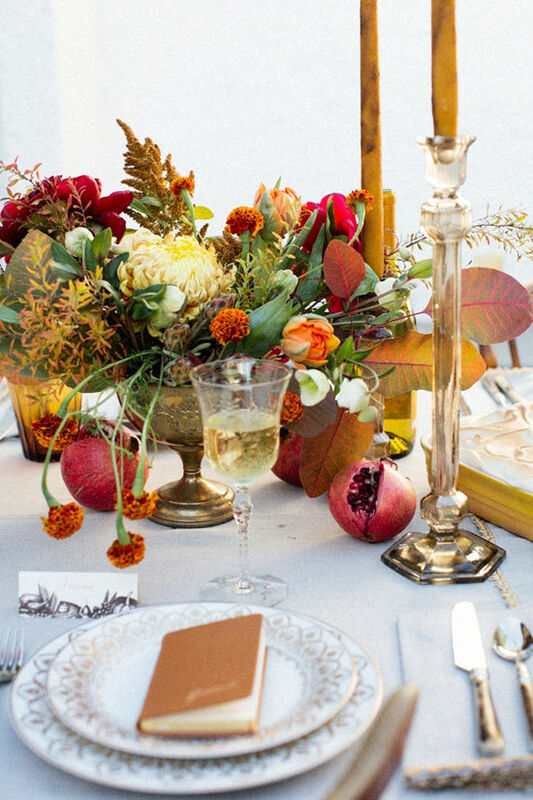 Love the color palette happening here – gorgeous! 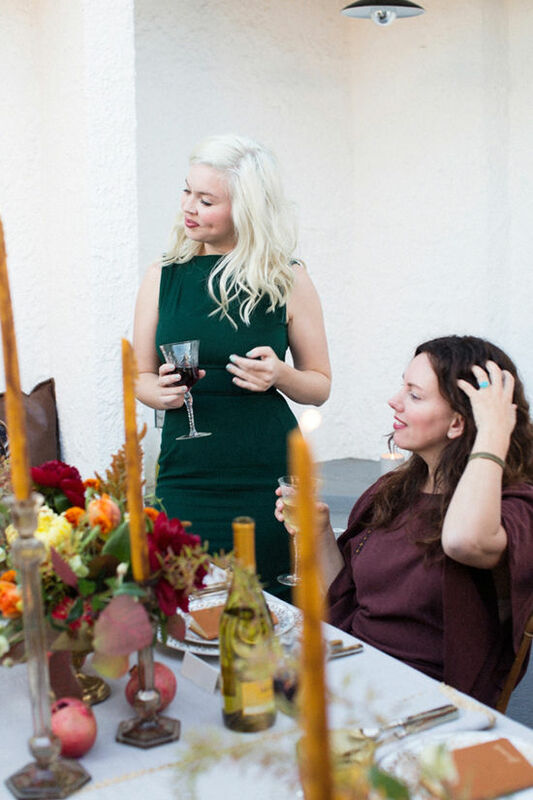 And what a fun Friendsgiving and all the pretty work that went into it! My mom makes the most killer scalloped potatoes for thanksgiving. Its unreal. I loooove stuffing! This is my favourite thanksgiving food ever! I just love this giveaway! 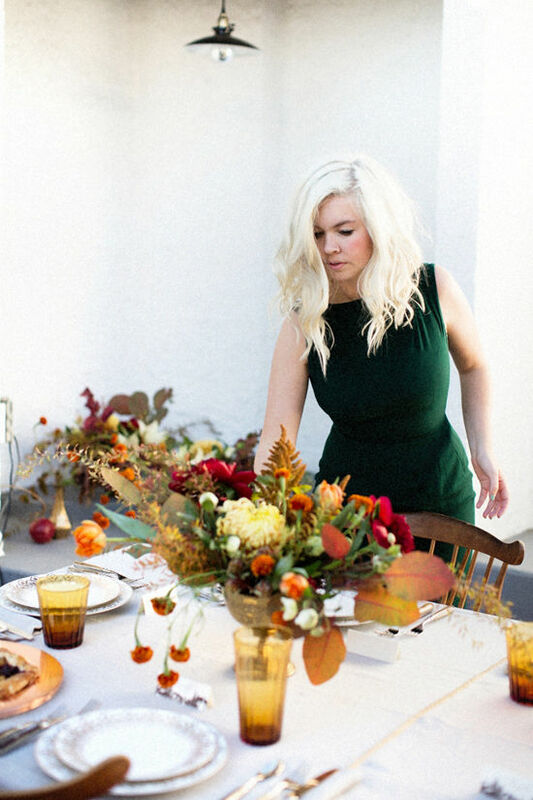 when it comes to thanksgiving i’m a sucker for traditional green been casserole, i also look forward too all the different sweet potato dishes. Put toasted bread crumbs in large metal bowl. Saute onion and celery with oil and butter until soft; add sage. Stir and cook to combine flavors. Add to bread crumbs. Stir in the chestnuts and parsley, add enough stock to moisten. Place in buttered baking dish, cook 350°F for 1 hour, uncover during the last 20 minutes of cooking. Without a doubt, my favorite side would have to be the carrot cashew curry casserole from Mollie Katzen’s classic Enchanted Broccoli Forest cookbook. Such a good alternative to sweet potatoes. I am in love with that crazy NPR horseradish cranberry relish. I’ve made it every year for the last 4 or 5 years. It makes every dish more delicious! Pumpkin pie is, of course, the bomb too. my absolute fav thanksgiving side dish is… green bean casserole. no fancy ingredients, just cream of mushroom soup and fried onions. tastes like childhood! thanksgiving food is so great! i love to slice potatoes rather thickly and put them in the oven along with olive oil, sea salt, and rosemary…. so yummy! happy thanksgiving to all of you. My favorite recipe to make on Thanksgiving is a pumpkin custard – best served chilled, in a pretty dish with whipped cream on top and chopped pecans as an added bonus. I’ve been making this since I was a little girl! It happened to be the easiest kid-friendly recipe my mom found in a cookbook. When I cooked my very first Thanksgiving I remember being so intimidated to cook the turkey. I was embarrassed to call my Mom and ask her how to bake a turkey and instead researched about 100 recipes online and finally choosing one that sounded do-able. After a couple of years/trys with different recipes I finally admitted to my Mom that I didn’t know how to bake a turkey and could she please help me. I am still in awe of how fool proof (no basting required) her recipe is and how good it turns out. It’s simply to cover the turkey in oil, put some bay leaves underneath the skin, rub salt & pepper (and any other spices – sage etc.) all over it and cook! I swear it turns out delicious!! My favorite Thanksgiving recipe is a fresh tangerine ginger fresh cranberry sauce. There is something so bright and beautiful about the fresh, clean taste of raw cranberries with those flavors. My favorite Thanksgiving side dish is a twice baked potato casserole. Gorgeous event, Bri! 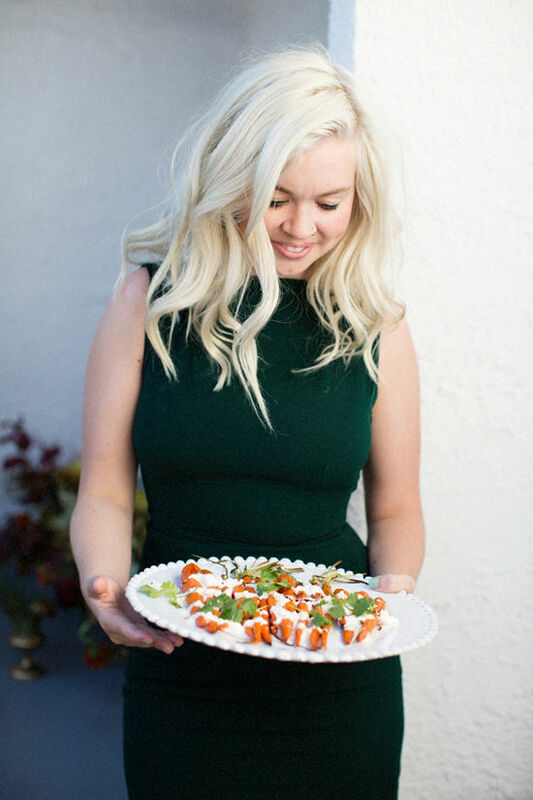 Your new home is to die for 🙂 My favorite T-giving side dish is broccoli cheese casserole—yum!! My favorite Thanksgiving dish is our from-scratch green bean casserole! My mom always made it growing up, and now that I am older and have house of my own, the torch has been passed on to me. In fact, I just went shopping for all the ingredients for this year’s casserole! Hi D E S I G N L O V E F E S T! I love to make spinach dip and buy a round rye bread cut a hole in the middle and put the dip there you can use the bread and crackers to dip. My favorite dish to share is sweet potatoes. My favorite side dish I make for thanksgiving is cranberry sauce with apples & pears. It’s like grown up applesauce & I make a big batch so I can snack on it long after turkey day. Can’t get any better than classic, savory stuffing. i love to make sweet potato casserole with crunchy pecan brown sugar topping! cheers! i’m all about the green beans ! All families seem to have a funny 50s fruit salad. Ours is a fluffy fresh cranberry and grape mixture bound together by whipped cream. It’s a must! A bag of cranberries with an entire quartered orange, plus sugar to taste. Whizz it in a processor until coarsely chopped! I love making what I call “Cranberry Awesome Sauce.” It’s simple, beautiful and delicious. A traditional thanksgiving meal has so many great savory and sweet dishes that it’s hard to choose! But if I must.. my mother-in-law always makes a new “Harry Potter” themed dish each year for Thanksgiving. My favorite to-date has to be the chocolate trilogy pudding!! So yammies! i love my mother in-laws creamy mash potatoes! so yummy! 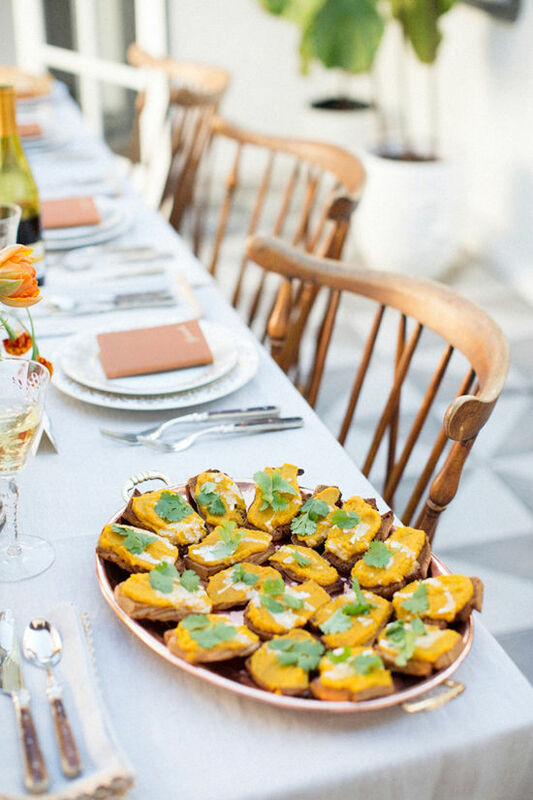 Absolutely gorgeous looking set-up and the food look delicious! 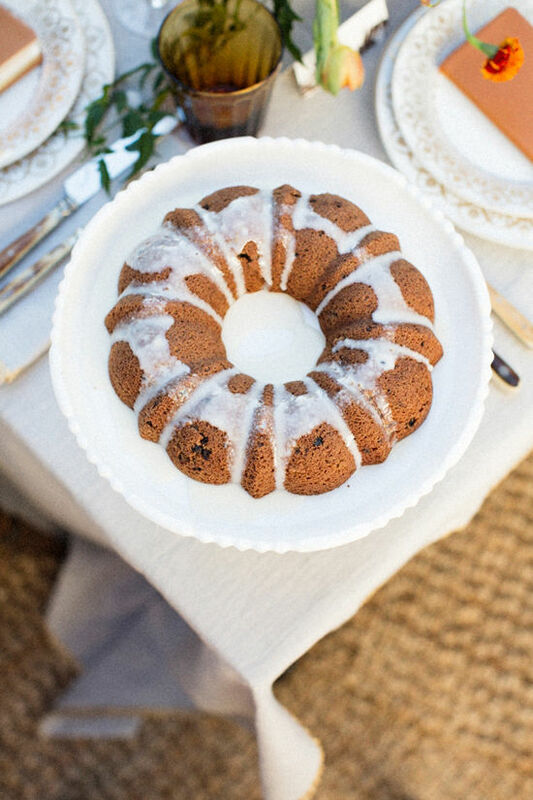 I love that bundt cake! 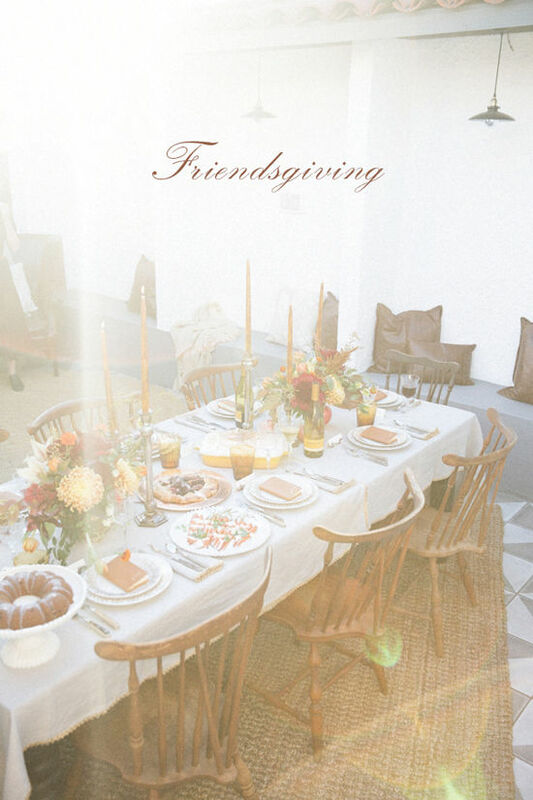 This gave me an idea of hosting a friendsgiving as well. Thank you so much for this! It looks perfect! Hope mine would turn out well. 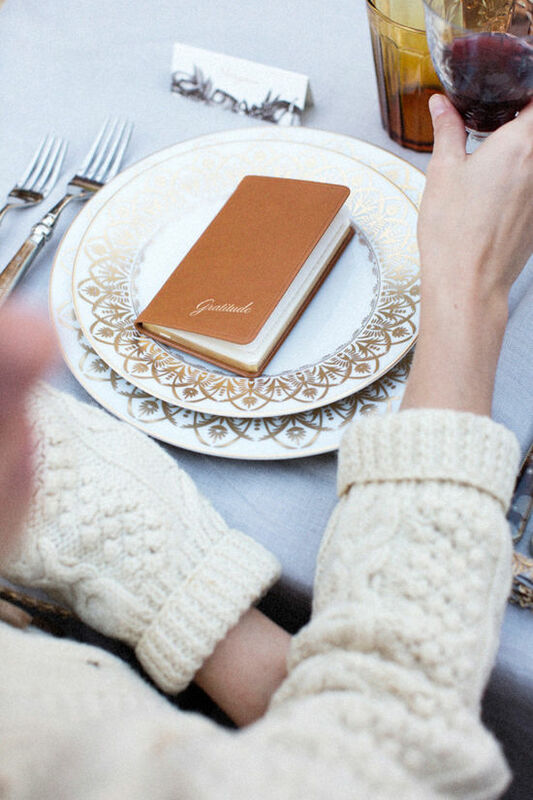 Your table setting is so beautiful! 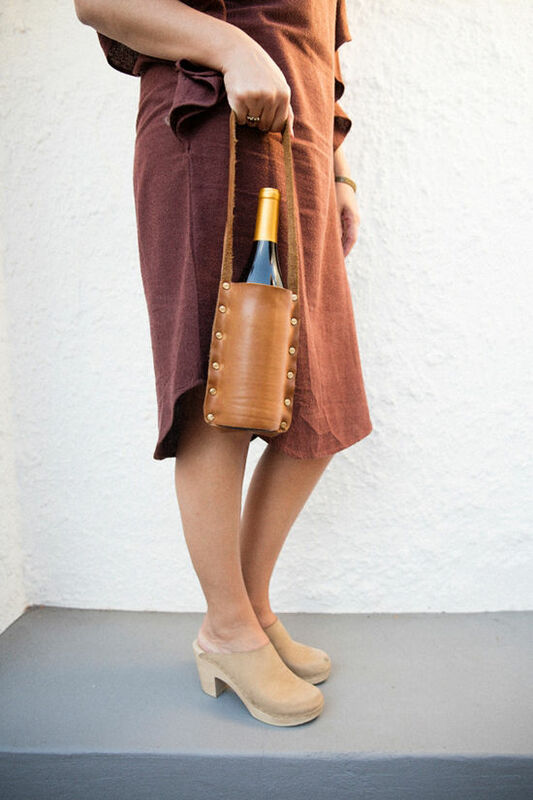 I love the wine holder too. Love the color tones as well. This is such an inspiration, I hope I can use this soon for the upcoming Thanksgiving this year.